Enjoy the fresh water of our pool! The perfect holiday home for your family! Campolivo Holiday Home is located in Villavetro of Bogliaco, a charming hamlet just a short walk from Lake Garda. It enjoys a privileged position, in the middle of an oasis of peace, in an olive grove of 5,000 square meters. Between mountains and lake, it is a perfect place to relax and have fun! 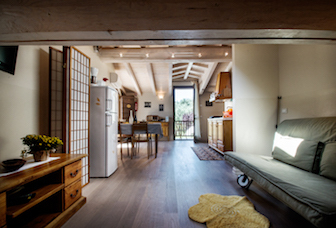 Surrounded by ancient walls, it is a completely renovated farmhouse. The charm of ancient blends with the innovative functionality thanks to its high quality and natural materials. The property follows with passion a green and eco-sustainable philosophy with particular attention to saving in energy consumption. Campolivo consists of four apartments suitable for every request, fully furnished with everything you need for a pleasant holiday. Guests have free access to the garden-olive grove, super well-kept. It has an above ground pool and a solar shower, sun beds, hammocks, tables and gazebos with intimate and evocative spaces of relaxation. A paradise for children who have at their disposal swings, table tennis, slackline and ample space to play in a safe and secure place. Our guests can borrow bikes for free. Particular pride of the house is the synergic vegetable garden. Cared with love throughout the year, in summer, the garden offers the opportunity for guests to gather its products. Banned the use of chemical products, there is a continuous effort to use new natural growing techniques combining flowers and vegetables. 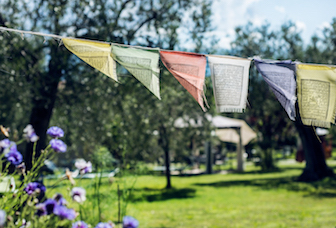 The novelty of the season is the opening of “Chiostro Arcobaleno”, a cheerful indoor multifunctional space, in the middle of the olive grove, available to everybody. Guests can use for free outdoor barbecue. 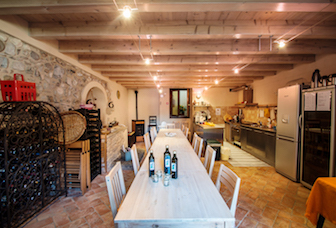 Guests also have free access to the shared kitchen (our “Taverna”), fully equipped for cooking or simply to meet with other guests. Free parking inside the garden.